Los Angeles, CA (November 29th, 2018)– An eleven bout USA Showtime televised card of boxing will be featured at the Staples Center in Los Angeles, California, on Saturday, December 1, 2018. Will it be his time? Travis ‘Big Time’ Kauffman will face Luis ‘King Kong’ Ortiz in a 10 round heavyweight explosion match sure to end in a devastating knockout for one of the competitors. Kauffman, 32-2 with 23 knockouts, Reading, Pennsylvania, was unable to defeat Tony Grano, Amir Mansour, and Chris Arreola in his three critical bouts. Ortiz, now 29-1 with 25 knockouts, a 39 year old southpaw Cuban out of Miami, Florida, lost to WBC World Heavyweight champion Deontay Wilder by tenth round stoppage this past March, and is coming off a second round knockout win over Razvan Cojanu at the Staples Center this past July. For Kauffman to win, it will be by decision, with heart, speed, stamina, timing and game plan the critical keys to victory for Kauffman. Simply put, Kauffman must be able to outmaneuver the wily Cuban. On the other hand, Ortiz hits hard and does not play games. Kauffman could get overpowered and stopped anytime from the eighth round on if he offers Ortiz too much of a target and finds himself too flat footed. Training discipline will be a major factor in this important heavyweight crossroads bout, as in who wants it more. The winner advances, the loser is done, in a nutshell. Kauffman has won 10 rounders twice in his career, while Ortiz has won only one eight rounder. Ortiz has never won a bout which has gone past the eighth round. Kauffman has gone 12 rounds twice but did not win either bout. 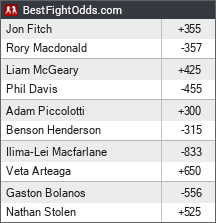 Perhaps neither fighter will be decisive enough to stop this bout from going to the cards. For the moment, it is hard to tell which fighter will want it more. Kauffman, who is not a hard hitter, has never won a big fight, but with Ortiz only a few months short of 40 years old, this is Kauffman’s big opportunity, and he might as well take his chances. Two undefeated heavyweight champions meet for the first time since Ali versus Frazier I.
Undefeated Mexico City’s Licona is predicted to win world title over southpaw Filipino. United Kingdom’s 6-0 Joyce was Silver Medalist at 2016 Olympic Games in Brazil. Undefeated British featherweight Lowe moves up in weight class versus Argentina’s Baez. Mexican controversy. Julio Cesar Chavez Sr. pulled his son Julio Cesar Chavez Jr. out of this All-Mexican bout with Angulo, with Chavez Sr. stating he felt his son was not prepared well enough. Ecuador’s Flores replaces Chavez at last minute. Scheduled for eight rounds. 7-0 Rodriguez, San Antonio, Texas, was 2017 World Junior Championship silver medalist. 25-1-1 contender Williams will have his hands full with 36 bout Mexican veteran Castro. 2-0 Marcellos Wilder is younger brother of World Heavyweight champion Deontay Wilder.